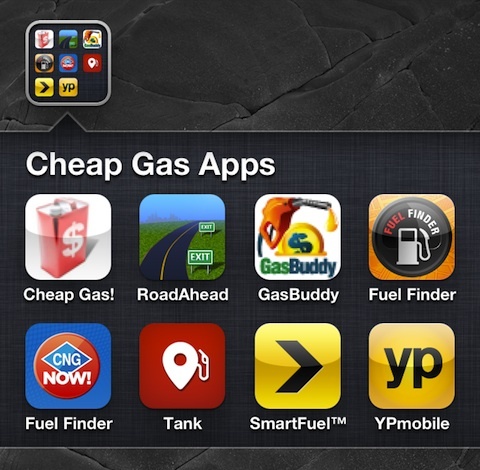 Are you looking for iPhone apps to find the cheapest gas prices in your area? Do you like to monitor the savings in driving an extra 3/4 of a mile to save 15 cents a gallon? Are you like me and find yourself looking for the closest gas station–preferably downhill–to allow for ample coasting? Do you like to save money and help others by crowdsourcing gas data? We have reviewed eight iPhone apps to help you find the best one for your life and your driving habits. The summer driving season is ahead, and fuel prices will be going up. So grab an iPhone app from the list below to help you save money at the pump, and keep the tires in your vehicle properly inflated to maximize your fuel economy. My husband commutes 150 miles round trip for work, and this is his go-to cheap gas iPhone app. The registration is quick and easy. You enter your zip code, or press location services to find the cheapest gas. If you want to launch directly to choices using location services, you can make that adjustment in the settings menu. Your choices appear, and you can sort in one touch by distance or price. The prices are gathered via crowdsourcing, and the user and time posted is noted. If you would like directions to a specific gas station, your iPhone’s map services are launched to show your routes. To encourage crowdsourcing of GasBuddy.com’s online and iPhone app information, you earn points by reporting prices to enter their weekly giveaway of $250 of gas. To keep the GasBuddy.com iPhone app free, a banner ad is always present on the screen. GasBuddy.com is a great free resource for finding the cheapest gas on your iPhone. Yellow Pages has an iPhone app that includes gas prices, restaurants, attractions, and, well, everything in the Yellow Pages. Simply by activating the location services, the YP Local Search & Gas Prices iPhone app generates a list of gas stations and fuel prices near you. It doesn’t sort or filter easily. You scroll down, and the cheapest price is identified as “best.” The fuel prices that are neither best nor worst are identified as “good.” In one touch, you can see a map view of the gas prices. If you want directions, you will be connected to your iPhone’s map services. Unfortunately, YP Gas Prices does not have the same interface as GasBuddy.com, so you have to make multiple touches to get directions. If you want an iPhone app that covers multiple categories of attractions, stores, restaurants, and services, then YP Local Search & Gas Prices may be an adequate resource. If you want to find the cheapest gas near you, along your route, and calculate savings, then SmartFuel’s iPhone app is a solid option. The SmartFuel iPhone app may also be more appealing to road warriors and business travelers, as you can save frequent routes and locations in just a couple of moments filled with intuitive, quick gestures. If you want to find the cheapest fuel near you, the least expensive choice is highlighted in one touch. If you are en route and would like to track down the best choice, then you can enter a future location or destination. The best choices are highlighted for you. As you purchase fuel using the SmartFuel iPhone app, it will calculate your savings. So, if you are interested to see or track the difference in purchasing the cheapest fuel rate of $3.59/gallon instead of the $3.67/gallon down the street, you can track that feature. SmartFuel not only points to the cheapest gas around, but it lets you know exactly what your saving are for using it. Unlike most of the other apps on this list, the Tank Pro iPhone app relies on direct reporting from National oil price indexing services that monitor gas stations’ purchases for the current prices of gas. Visually, the Tank Pro’s interface is snazzy, bright, and sophisticated. From the home screen, you can choose to use location services or a zip code to find the cheapest gas. A list is generated with the name of the station, distance from you, and the price. The default for the list is the cheapest price, and there is no option for sorting for the closest gas. You can switch to map view, but you have to pinch the screen to manipulate the view. It’s not a manageable interface, particularly en route. Tank Pro’s iPhone app does incorporate some nice customization features. You can set favorite trips, in order to identify the cheapest fuel on the road. You can add stations to your favorites menu as well. Tank Pro is a snazzy little gas finder at $.99, and upgrades to map views plus sorting capabilities would make it even more awesome. At $2.99, FuelFinder is the most expensive app for cheap gas on this list. FuelFinder’s iPhone app is definitely the quickest and most responsive cheap gas app as well. From the menu at the bottom of the screen, you can choose to check out prices, update price per gallon via crowdsourcing, calculate your savings, find the closest gas station, and adjust settings. When you make a selection, a list of information appears instantly. There is no lag time in loading and updating. You can jump back and forth between a list and map view. One of the nice features of the map view is the use of the gas station’s logo. It makes for quick identification. You can quickly update pricing on one screen. For speed, agility, and smart interface, the FuelFinder iPhone app is a worthy investment for penny pinchers and frequent travelers alike. The Cheap Gas! iPhone app has a sense of humor and a fantastic feature that make it among the best on the list. When you touch the Cheap Gas! icon, you activate location services. It quickly responds with a list. At the bottom of the screen, you touch the @ symbol to sort by closest location. The @ symbol becomes a $ symbol. With a touch, the list is sorted by cheapest gas price. To report a station and prices, you press the + symbol. You enter information with simple, direct interface. The coolest and best feature of the Cheap Gas! iPhone app is the Cyborg. You touch Cyborg and hold the view finder. It tells you the price at the closest gas station in the direction you need to travel. There is no mapping. You can follow your Cyborg all of the way to the gas station. An ad banner remains on the screen, but it does not hinder functionality. The Cheap Gas! iPhone app has agility and function packed together for the amazingly low price of free. CNG Fuel Finder is a great iPhone app for finding the cheapest prices for compressed natural gas. You get started by activating your location services or mapping a route. Your choices can be viewed on a map or in list view. The compressed natural gas station’s pertinent details including phone number, address, price, and hours are available in one touch. CNG Fuel Finder’s iPhone app also incorporates social networking by encouraging you to rate a station, share it, and check-in. In one touch, you can also access the latest news and details about natural gas vehicles and technology. CNG Fuel Finder is a must-have for natural gas vehicle owners. Road Ahead Highway Exit Finder has potential, but needs some enhancement to become a more functional and useful app for identifying cheap gas. From the home screen, you can activate the location services to find you on the road and let you know upcoming restaurants and gas stations at the next exit. You can also choose to check out an interstate’s exits by using some scroll mechanisms to identify state, interstate, and exits. For each exit, a list of restaurants and gas stations appears. For each gas station, it shows the gas price and time of reporting of the gas price. All of the other iPhone apps on this list cited more recent updates to the pricing. I did find a flaw in the reporting for an exit, so the rating of this app was certainly affected negatively for this item as well. The Road Ahead Highway Exit Finder has great intentions, but it definitely needs to work on the quality of its content and interface to become a great cheap gas iPhone app. AppSafari review of iPhone Apps for Finding Cheap Gas Prices was written by Jenni Ward on March 6th, 2012 and categorized under App List, Auto, Shopping. Page viewed 7083 times, 1 so far today. Need help on using these apps? Please read the Help Page. Listed Iphone applications with rating to find gas prices was awesome.